Time and space is at a premium in today’s game. The speed of the game means players must make quicker decisions in less space and puck protection has become a crucial skill in order to manage the puck. Interesting to note that all three videos are from NHL games that were played in the first week of October 2017 and all three are executed in a slightly different way. During this sequence, CAR28 enters the zone with speed through the middle of the ice. 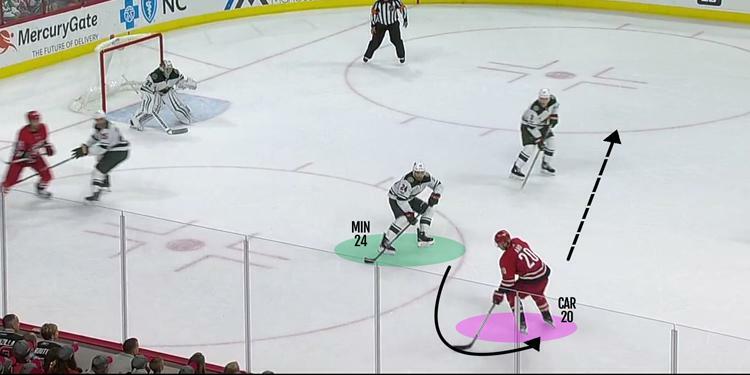 CAR20 supports the puck carrier but does not have any speed when he receives the puck and therefore is not a threat to beat the defender. MIN also has numbers back with 3 players below the puck. the delay creates time for CAR49 to jump into the zone (another example of the late guy being the most dangerous player on the attack). 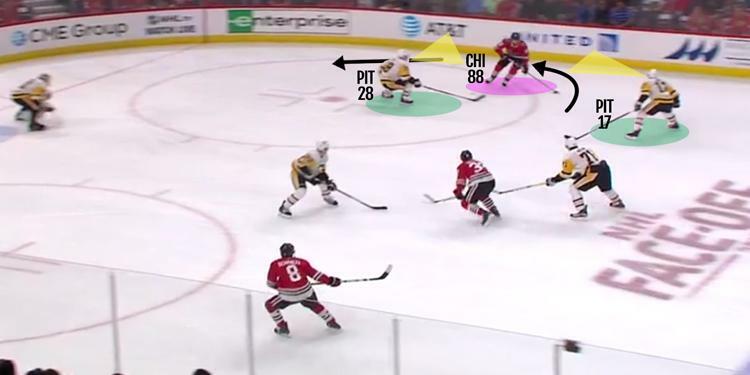 In this second clip, CHI88 uses a series of crossovers to enter the zone with speed on his off-wing. CHI88 is facing two defenders – with the backchecking forward taking away the drop-pass. CHI88 now attacks PIT28 1v1 and steps to the middle of the ice, threatening to drive to the middle of the ice. This manipulates the feet of PIT28 who looks to step-up and take away the lane to the net. This is the moment CHI88 is waiting for - he now uses the spin move to once again, protect the puck, but in this example, he uses the spin to attack the ice behind the defender. This once again, opens up a passing lane with two CHI players attacking the near and far posts. In the final example, STL91 picks up a drop-pass from STL26 and uses his speed to drive outside attacking the ice behind the defenders. In this case, he is a threat to go to the net and this threat draws two defenders. 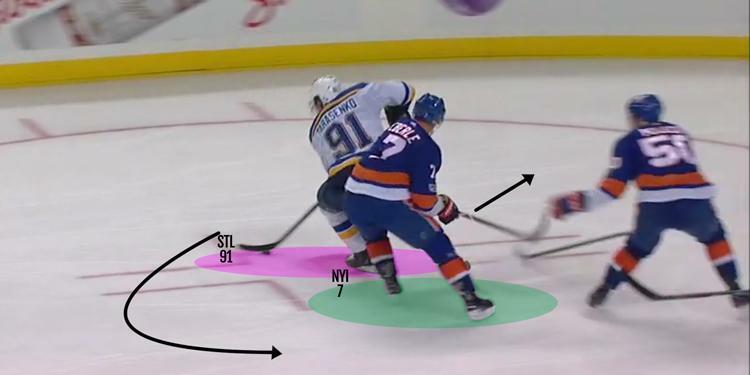 In addition, STL91 is willing to receive contact from the defender, in fact, he initiates it. This, again, allows him to manipulate the defenders feet who are trying to keep him outside and creates space to escape to, in the middle of the ice. 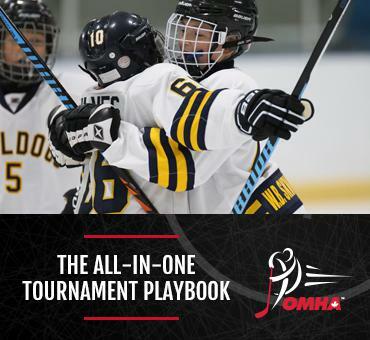 Finally this also creates an open shooting lane, changes the shooting angle and the goaltender is forced to find the puck which is hidden coming out of the spin. Three great examples of the same evasive skating and stickhandling maneuver used in three slightly different ways – all used to create time and space, protect the puck and create open passing or shooting lanes.